Our goal is to provide an exceptional stump grinder service to the community at a fair price for honest work. We found a great need in the New London County, Hartford County, Windham County and Tolland County Connecticut area and understand what it means to deliver what we promise. Cliffside Stumpgrinding guarantees the work that is delivered and offers our undivided attention to each and every client. We will arrive when we say and strive to provide true and quality work. Our pricing structure to remove a stump is pretty simple and easy to figure out for any house, yard, or area with multiple tree stumps ready for removal. Pricing does not include state sales tax and is subject to change. It’s easy to do and takes a few seconds. 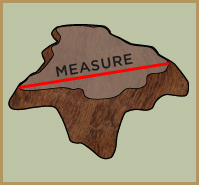 Measure the diameter of the stump at the widest point. Multiply the diameter by the price.